I'm a Food Network fanatic so when I saw that the editors had put together a cookbook with healthy, light but still yummy recipes I jumped at the chance to try it out! Synopsis: Using clever cooking techniques and ingredient swaps, Food Network Magazine’s test kitchen chefs have lightened up all the foods you crave. Each crowd-pleasing dish comes in under 500 calories with satisfying—not tiny—portions. With a visual table of contents—complete with icons that indicate vegan, vegetarian and gluten-free dishes—you can quickly find meal ideas for any diet. Plus, each recipe appears with nutritional information and a beautiful photograph, making eating right surprisingly simple and totally fun. 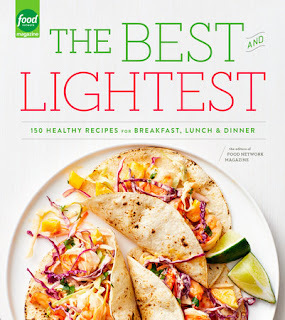 With the word lightest in the title, you would be safe to assume that there are a lot of light recipes in here, but that doesn't mean they aren't tasty. Now, I've only tried one recipe so far and while it wasn't perfect the fault was mine. When a soup recipe calls for small ravioli, don't think you can substitute HUGE ravioli and still get the same flavor. Nope, all of the cheesy goodness fell out once I cut open the ravioli and it just wasn't near as good as I'm sure it was supposed to be. I love that there are so many recipes, and a lot of good categories that I'll use. They did a great job of giving not just main dishes, but light snack ideas as well. I'm really looking forward to continuing to use this book in my light and fit journey! That sounds like an awesome cookbook! I am constantly on the prowl for lightened up versions of delicious dishes.